Asteroids frighten -- and fascinate -- us. Image: Illustration. 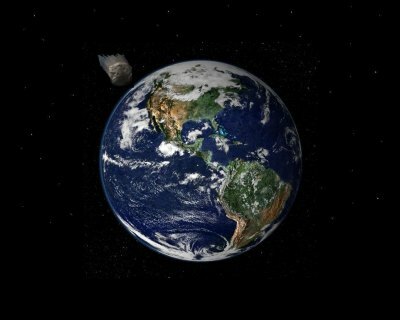 In mid-February, as millions of eyes locked onto the Winter Olympics, websites rattled with reports that an asteroid “the size of three football fields” would brush by Earth. Unlike the 2013 event, this time, asteroid watchers were ready. The website slooh.com was to stream images. Heads turned to the Internet. And then, well, nothing. The asteroid was probably there, somewhere. It’s just that we collectively blinked and missed it. The good news, if you could call it that, is that there are plenty more asteroids out there, and NASA is itching to get a closer look. Indeed, as part of NASA’s asteroid initiative, the agency will host an opportunities forum March 26 at NASA headquarters in Washington. This is the "next step" in advancing the agency's asteroid initiative -- an attempt to harness and study an asteroid. Q. What are asteroids? And how are they different from other space stuff? A. Asteroids are rocky bodies in orbit around the sun -- basically, space rocks. Most asteroids in the solar system orbit in a belt between Mars and Jupiter. Asteroids and comets are sometimes described as “near-Earth objects.” They are “nudged by the gravitational attraction of nearby planets into orbits that allow them to enter the Earth's neighborhood,” according to NASA. Q. How common are near-Earth objects? A. NASA and the broader astronomical community have reported 10,713 known near-Earth objects to date, according to a recent news release. Those are just the “known” near-Earth objects. Q. How big can they be? A. For the last century, Ceres was known as the largest asteroid in the solar system. In 2006, the International Astronomical Union, the governing organization responsible for naming planetary objects, reclassified Ceres as a dwarf planet. It is roughly 590 miles (950 kilometers) in diameter. Asteroids can be smaller, too, and many are not particularly threatening. According to NASA's Asteroid Fast Facts: "Space rocks smaller than about 25 meters (about 82 feet) will most likely burn up as they enter the Earth's atmosphere and cause little or no damage." Q. Why are scientists so interested? Q. Are we sitting around, waiting for a space rock to hit us over the head? A. Actually, NASA has plans in the works for dealing with asteroids. First, the agency wishes to capture and redirect an asteroid mass into a stable orbit around the moon. This would be a “very small asteroid,” according to NASA. Another plan is to retrieve a boulder from a larger asteroid and put it in lunar orbit. Astronauts aboard an Orion spacecraft would study the redirected asteroid in the vicinity of the moon and bring back samples, NASA says. NASA has also issued the Asteroid Grand Challenge, an effort to employ government, industry, academic collaborators and even citizen scientists to find asteroid threats and figure out what to do about them. Q. What's the bottom line? A. NASA spends $20 million a year in the search for potentially hazardous asteroids through the Near Earth Object Observation Program. The agency’s budget includes $105 million to plan for the capture and redirection of an asteroid, along with projects to identify, track and characterize asteroids -- and conduct studies for mitigating potential threats.